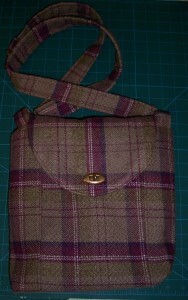 In preparation for the next bag-making class at New Threads, Weyhill Fairground I have made another demonstration bag. 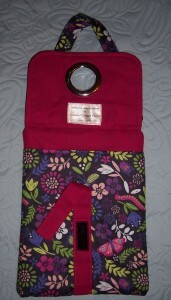 This is the multi-purpose tech/tablet bag also designed by Deby Coles. I needed to make a demonstration bag so that I could refresh my memory on the construction details and also check timings for the different sections that go to make up the bag. For the bag I used the remnant of Lewis & Irene Our Friends in the Garden left over after making the latest Cross Body Bag plus some more of the Cerise Pink cotton remnant from a re-cycled skirt. I have a supply of the Silver coloured grommit rings which I combined with nickel hardware, two D-rings, two Swivel Clip Hooks, a Strap Adjuster and a Twist Lock. For the closing strap I used a short strip of Black Velcro ® tape. 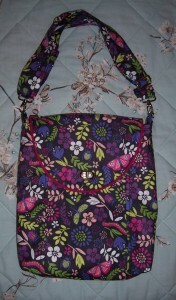 For the reverse pocket I used a Purple zip fastener from my stash. Apart from using the bag as a demonstration it will also house my own Kindle e-reader – it will definitely stand out in the crowd! 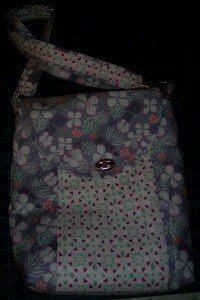 I have now made my very first Tote bag using Oilcloth! 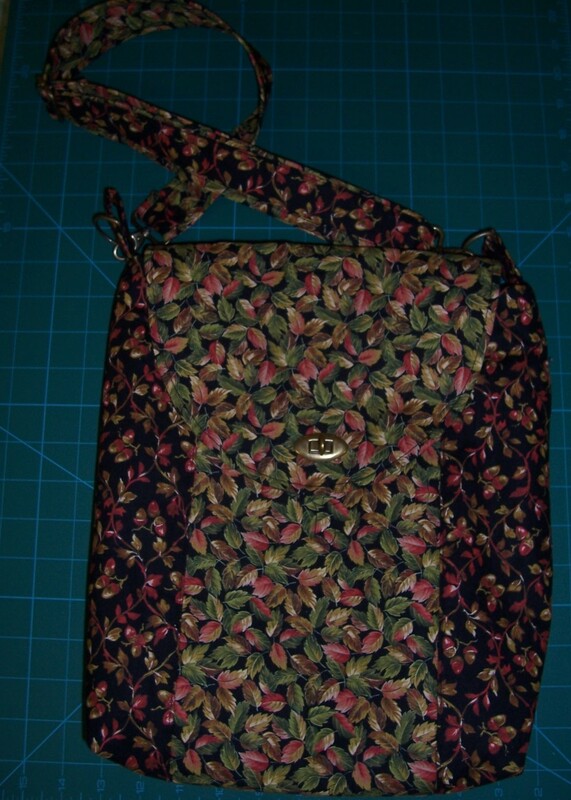 Having recently made a Cross Body Bag with Faux leather I felt sufficiently confident to have a go with this “new-to-me” fabric. 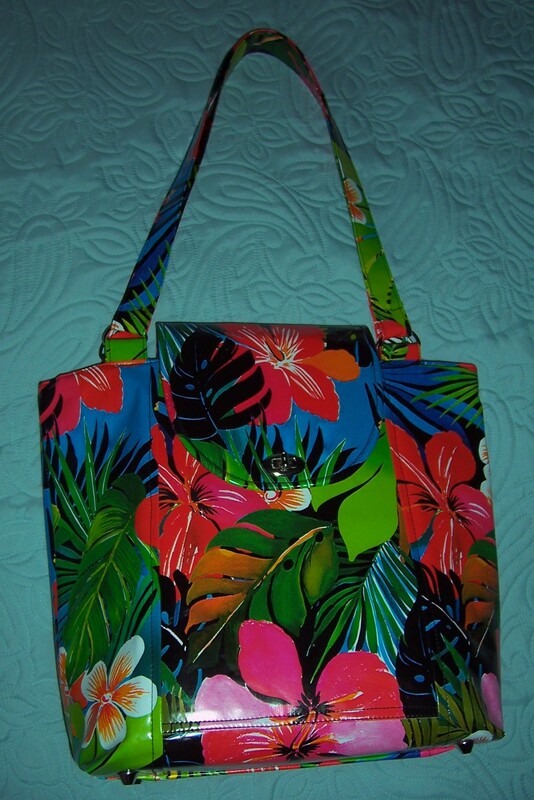 I purchased the boldly coloured Tropical print cloth from The Range at the bargain price of £3.50/metre so that if the bag did not work out then I would have wasted only my time and not expensive fabric! I cut approximate sizes for the panels and pockets and stitched using the Teflon coated foot on the machine and a 3.0 stitch length. As I was unable to use any heat on the cloth I did not apply any fusible interfacing and only “finger pressed” the seams, but top stitching helped to keep the seam allowances neat. Also being unable to use pins on the oilcloth instead I used the clover clips which I purchased some time ago. They were great and I very quickly had the outside of the bag constructed. I adjusted the sizing of the bag slightly and decided to make the base a generous size, also to use plastic mesh bag base and nickel bag feet which I had in my “bag-making stash”. This was the first time that I had used the mesh and bag feet which were simple to install so I will definitely be using those again. For the lining I used a remnant of Strawberry printed stretch twill bought on sale from New Threads. As I had only a small amount of fusible fleece in stock, I tried out the new pack of Bosal one-side fusible foam fabric. 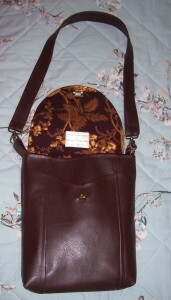 Having done a test fuse I made sure that the Bosal was cut ½ inch smaller all around before fusing to the lining pieces and constructing the inner bag. For the strap/handles I cut two lengths 4 inches wide x 29 inches long and double folded before top stitching both long edges. 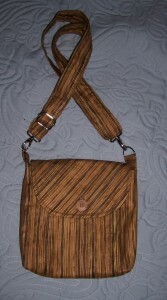 I made 4 sets of tabs with D rings which were basted to the top of the bag prior to adding the lining. 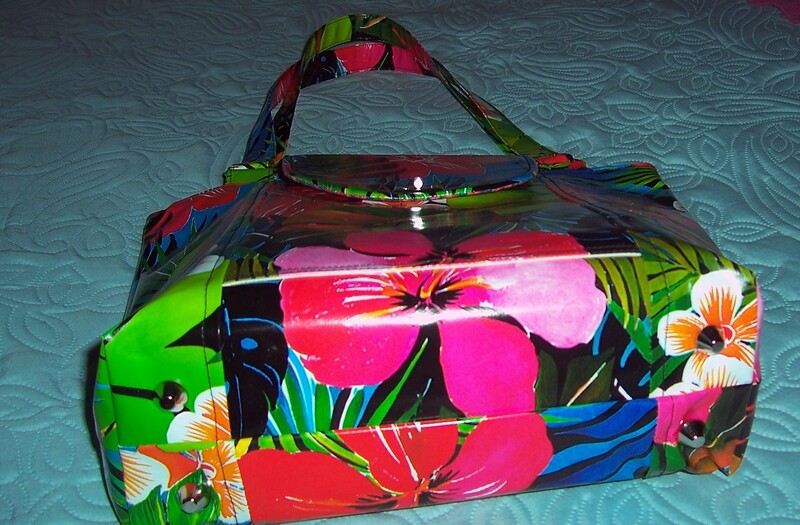 As I wanted to avoid scrunching the oilcloth when turning the bag right side out, to attach the lining I simply folded down ½ inch of the top of the oilcloth, ½ inch of the top of the lining and then top stitched the lining in place wrong sides together. 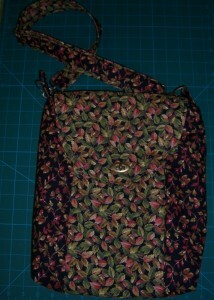 Once the lining was stitched in place the finale was to attach the strap/handles to the D rings and it was done! 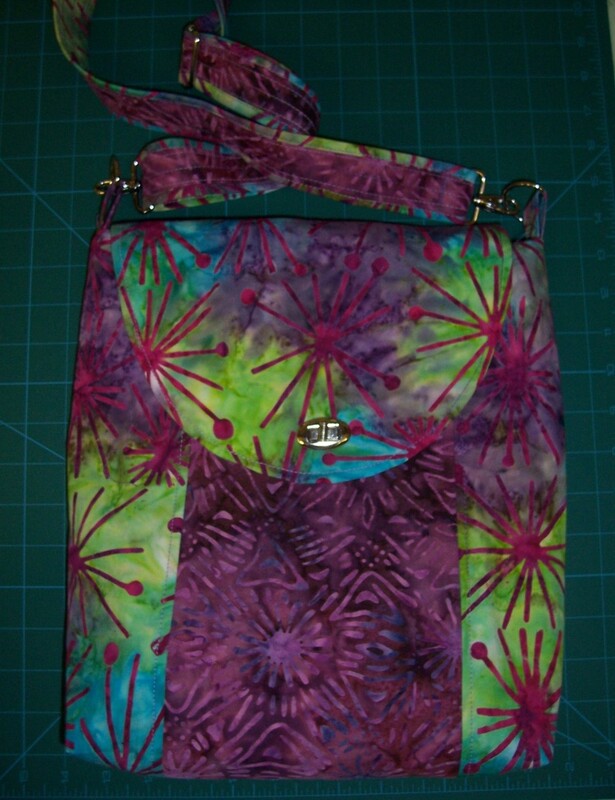 I am very pleased with the way the bag has turned out and will definitely be making more, especially now that I have refined the exact dimensions that I like for the bag and calculated the fabric requirements. 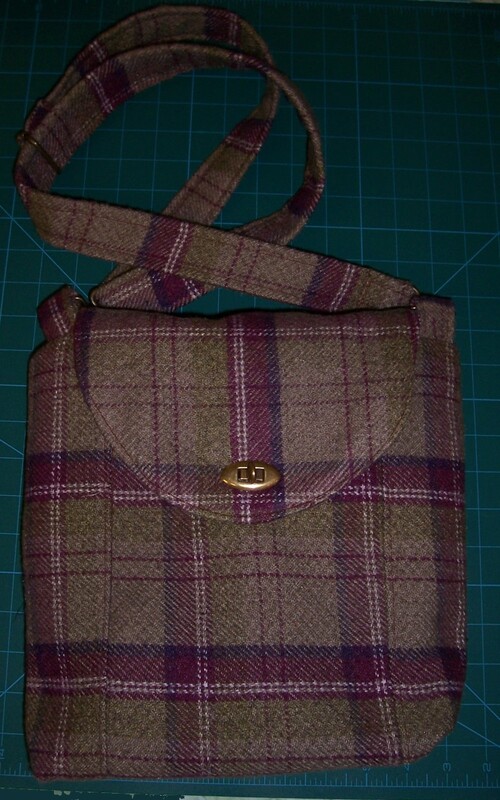 This particular bag is relocated to West London as I have given it to a good friend as part of her Christmas gift instead of a stocking! Wow! 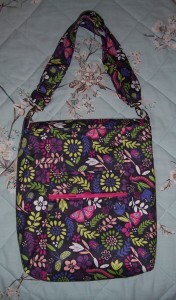 A change from Cross Body Bags! Yes, after all those bags it is now time for me to turn to my “roundtoit” list and get cracking on some dressmaking and Christmas projects. 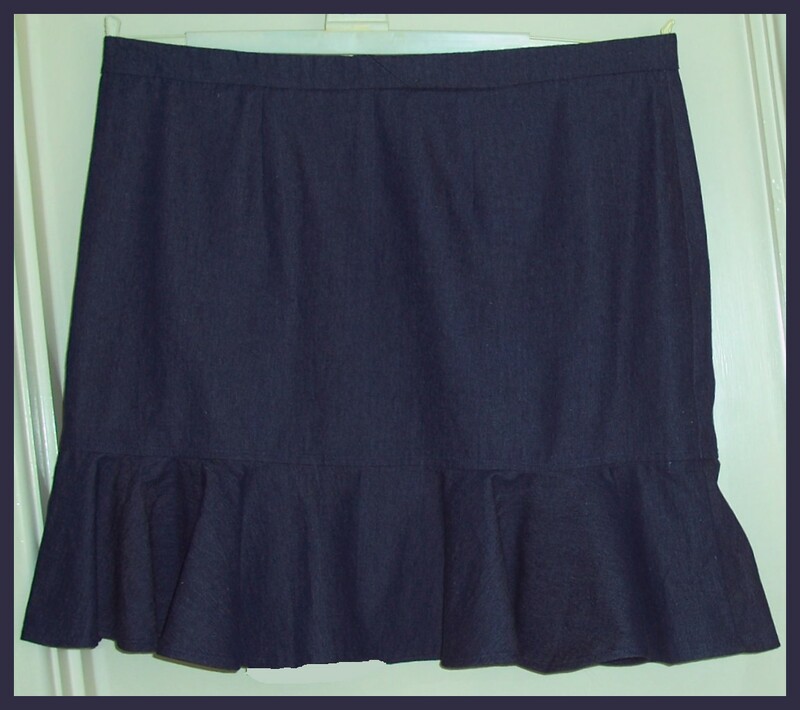 Inspiration for this skirt came in the form of a promotional photograph for Pavers shoes. No shoes were purchased in pursuit of this project but a lot of lessons learned about my figure and skirts. I decided to use this construction as a “test” before making a similar skirt using some lovely Mustard wool tweed purchased from B&R Textiles of Salisbury. I had a length of denim in my stash that I had bought from Fabricland so having overlocked the edges put the fabric through the wash to get rid of excess dressing and check for colour run. Unbeknown to me there was a towelling teacloth in the washer at the time – this came out a charming shade of Blue. Now I know to wash the completed skirt separately in future – and make sure the machine is empty before I switch on! I measured myself and made a note of the inches before turning to my TNT prima dress pattern. I hacked the pattern by cutting through the waistline and adding a seam allowance. I already had a note of cutting line for the bias hem frill so placed the pattern pieces and cut out. 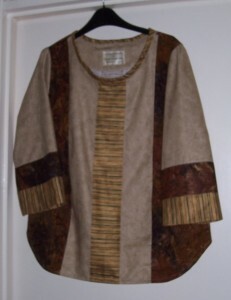 Although the original dress is made with sufficient ease to wear “pullover” style as this was to be a more fitted garment I would need a zip and waistband. 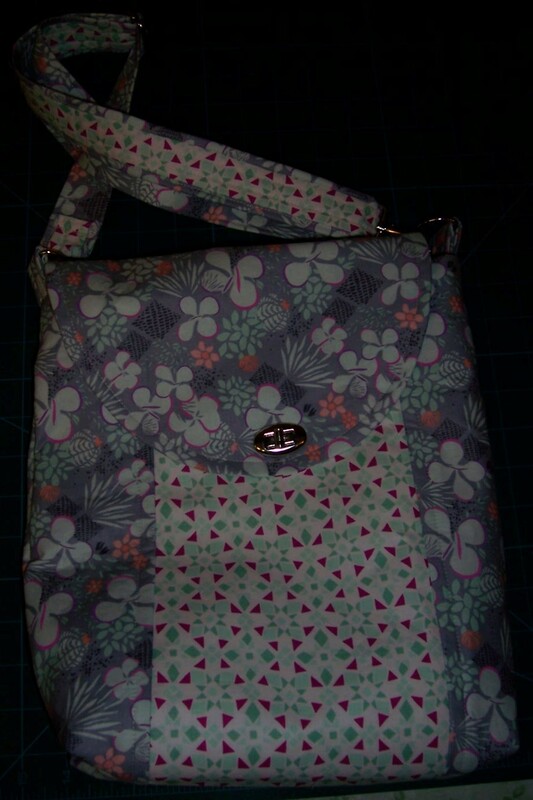 I used my favourite lapped zip insertion method using a grey zip from the stash. It went in beautifully and the zip was completely concealed by the lap. I made the darts front and back then basted the side seams prior to first fitting. Oh dear! I know that I have been losing weight but this was ridiculous! There were inches of excess fabric at each side seam and I could put the skirt on without opening the zip – back to the drawing board. I basted a new seam line 1 inch in thereby reducing the width of the skirt by 4 inches and tried again. Yes, now it was much better. 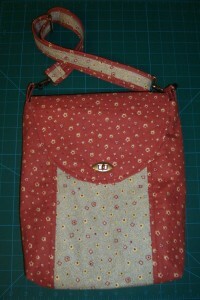 I made a note to lower the waistline at centre front and grade out at the side seams. Having re-stitched the side seams I overlocked the seam allowances and proceeded to attach the bias hem frill. I used the trusty twin-needle for machine stitching the hem and also for top-stitching the seam where the frill was attached to the main body of the skirt. I cut a waistband 4 inches wide and attached to the skirt. Back for another fitting. Oh no! Still too big! In disgust I put the skirt to one side and went out to visit a friend. 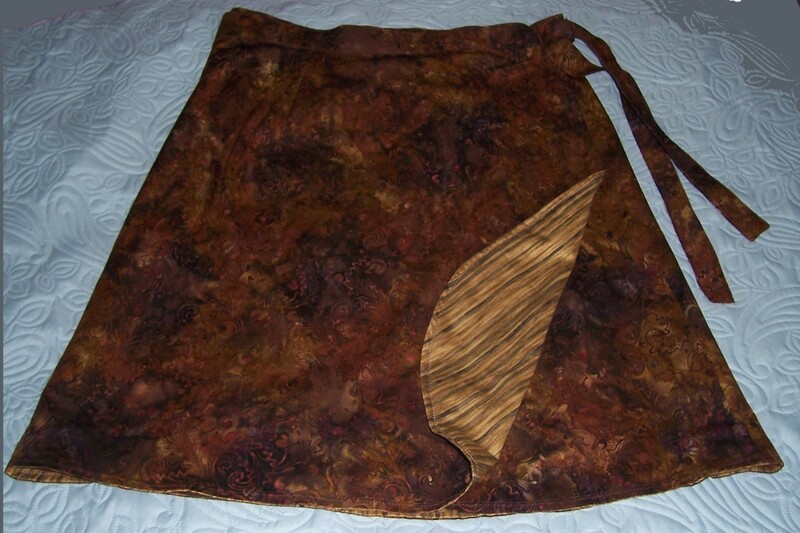 Next day – I was determined to finish that darn skirt and make it wearable. Bearing in mind that I might yet lose more weight the waistband would need to be “versatile”. I removed the waistband, removed the zip and re-stitched the centre back seam in its entirety. I re-cut the waistband having taken off another 2-3 inches from the length. I re-attached the waistband by basting on the machine and using the feed dogs to ease the extra fabric of the skirt to the waistband. I left a gap in the centre back seam of the waistband to facilitate insertion of petastretch elastic. Having inserted the petastretch and safety-pinned in place it was time for the third, and I hoped, final fitting. Third fitting – ah! That is soooo much better! I stitched the end of the petastretch together by using a triple zigzag stitch over a small piece of crepe de chine which covered the raw edges and completed the waistband by “stitch-in-the ditch” from the right side. A final press and it was done. Conclusion: Now that the waistband fits nicely I find that because my hip joints are no longer symmetrical and one leg is shorter than the other thereby affecting my posture, the skirt does not hang as I would like. To correct this would take a lot of “finessing” and then who knows what my posture will be like once the hip replacement surgery has been completed? So, in future when a skirt is required I shall make a Pinafore Dress and then the garment will hang from the shoulders and avoid all that “quirkiness” of hip joints and posture. Let’s hope that I purchased sufficient wool tweed to make a Pinafore Dress rather than the skirt I originally planned. Are you getting bored with all these versions of the CBB? I am not, as each and every construction looks so very different and is a joy for me to have and wear depending on my mood and what I am wearing. OK, but now that I have made version 15 and have no more workshops booked until 2016 I will be making different projects for the rest of the year so there will now be more variety in the blog posts. 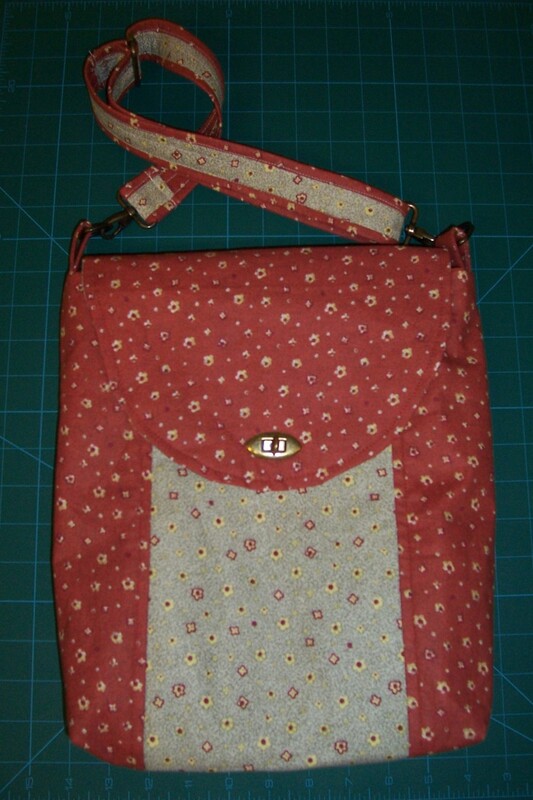 Before I move onto pastures new, just a little bit of information about bag no.15 which was made whilst demonstrating the construction at the workshop held on 14th November at New Threads, Weyhill Fairground. As indicated in the heading, the main fabric of the bag is made from a Lewis & Irene printed cotton – Our Friends in the Garden. I just love this print on the dramatic dark background which I felt was complimented by the bold Cerise pink cotton lining. That came from cutting up a skirt that I no longer wear (Skirts and me – more of that in the next post). In order for the construction details not to be lost in the design of the print I added some narrow piping for definition of the curve shaping of the flap. 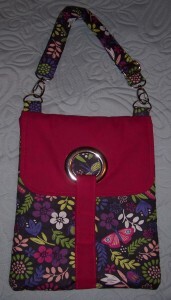 For the back zipper pocket I repeated that definition by using a Cerise pink zip. Although I cut the strap just 4 inches wide, I did not turn in the full amount of seam allowance and hence the strap is slightly wider than the hardware, I like that the strap is now more stable when sitting on my shoulder. 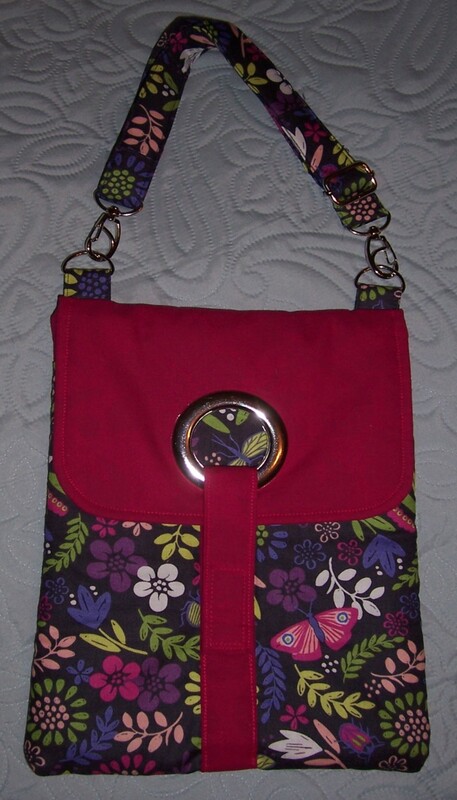 Cross Body Bags – that’s all folks! 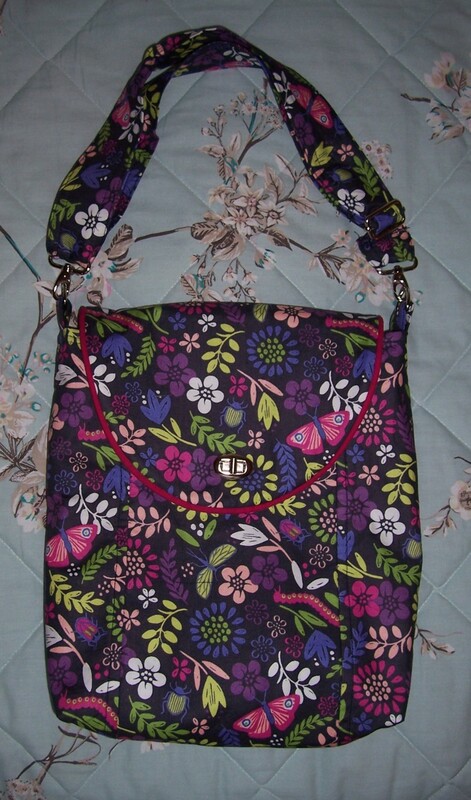 I have not used this fabric before and as I am now very well-versed with the pattern of the Cross Body Bag decided that it would be an opportunity to test out sewing with Faux Leather. I purchased just ½ metre of Brown colourway from Fabricland, Salisbury branch. I discussed with the assistant what needles and machine feet I should use and she recommended “leather” needles and a teflon(R)-coated or “smooth” foot, alternatively an even feed/walking foot. As I plan to sew some “oilcloth” later, I purchased a smooth foot through eBay which will come in handy for that sewing project. I found the cutting of pieces from the faux leather very easy and as it is backed with a fine jersey fabric did not feel the need to use fusible interfacing. For the lining I purchased a metre of Brown/tan printed cotton “Tuilleries Classically Home Collection” by Marianne Elizabeth for Benartex from Franklins. 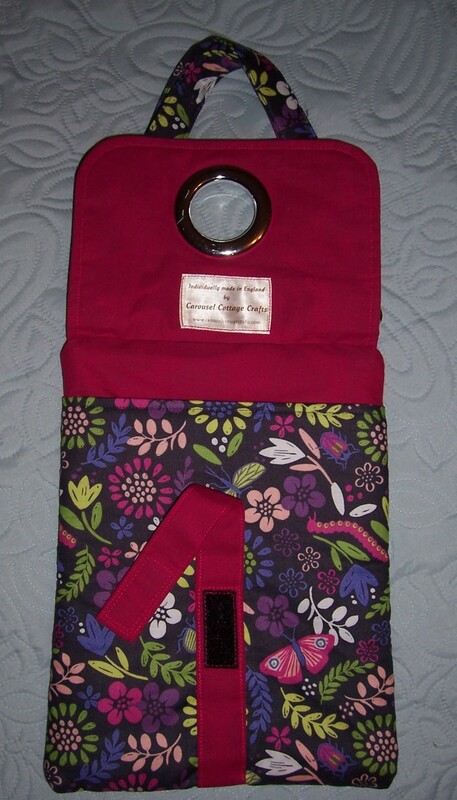 I applied the fusible fleece to the lining pieces and having done a quick stitch test on the faux leather, I was away. I used a Brass twist lock fastener and all the other hardware was also in Brass. I finger- pressed the seams and top-stitched ¼ inch as directed in the pattern instructions with a slightly longer stitch length of 3.00. For the strap I cut a piece 4 inches wide and once folded and top-stitched, due to the thickness, decided against the use of a strap adjuster. 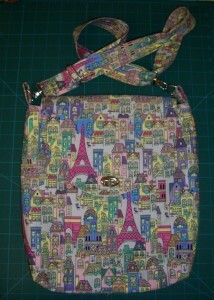 The only problem I had was when stitching the lining to the outer bag and trying to stitch over the strap tabs. At this point there were 10 layers of fabric! By going very slowly and hand-turning the flywheel I just about managed to stitch across at those points. However, once the bag was turned right side out when it came to top-stitching, I missed out the area where the tabs were set as that would have been just too much for the leather needle to cope with. I have approximately half of the faux leather fabric remaining and plan to make a tote bag based on the same principles as the CBB (I.e. 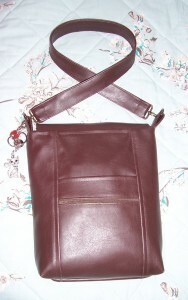 3 panels per side) but with different dimensions, fastening and pockets – so not really similar at all! Saturday 14th November. 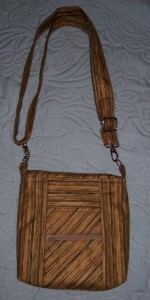 Yet another great day tutoring a Cross Body Bag workshop at New Threads, Weyhill Fairground. There were 6 ladies attending and by close of business we had seven completed bags. I opened the workshop with a short introduction of my sewing career and demonstrated several incarnations of the bag in a wide variety of fabrics from quilting cotton to my latest production which is in faux leather. Taking into consideration those things that I learned from running the previous workshop at this location, I prepared a timetable allowing approximately 45 minutes for each section of the construction of the bag. This worked well and although we did not keep exactly to the plan we were able to take a 30 minutes break for lunch and finished just 15 minutes overtime. I had prepared the pieces for another bag for me. Each piece cut out, with the fusible interfacing or fusible fleece applied and ready-labelled so that I could demonstrate each operation to the ladies. This was especially useful when it came to inserting the parts for the twist lock and the two different methods of insertion of zip fasteners. 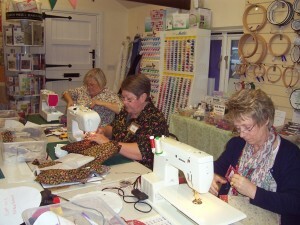 In this workshop 4 of the ladies decided to use 2 contrasting/complimentary prints which worked extremely well. 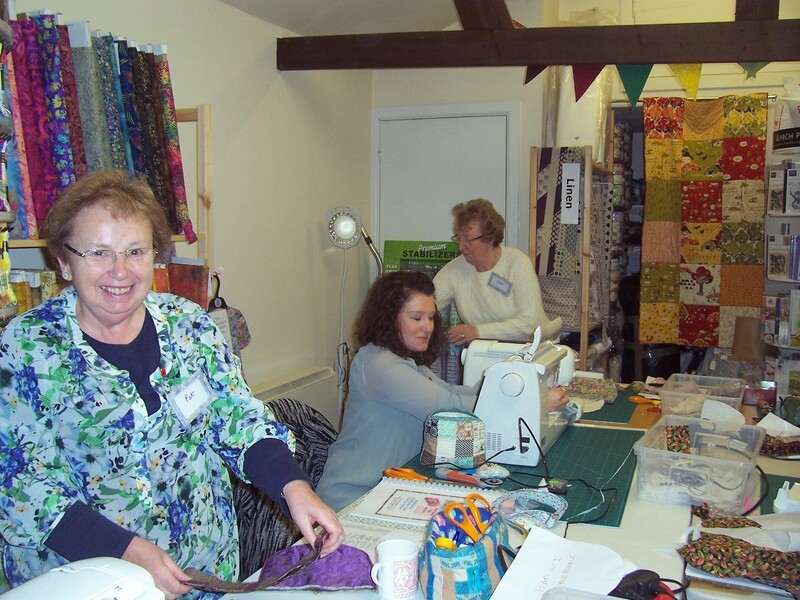 The bag design can be made from a variety of fabrics, those made in this workshop were in 100% quilting cotton with one in wool tweed blend. 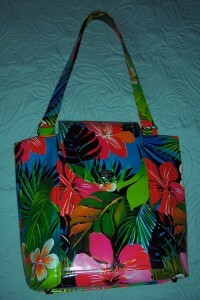 The bags that the ladies made were diverse and each one totally covetable as you can see from the photographs below. I was recently asked if there was a way to make the Cross Body Bag in a smaller size. The answer is of course, yes. Taking note of the proportions of the original CBB I drafted a new cutting plan for a bag to be a finished size of approximately 8 inches square. 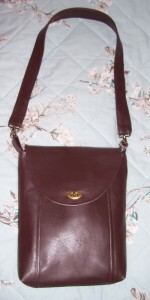 This involved reducing the size of the pockets, strap and flap before making up a sample. I used remnants from the recent colour block tunic top and 25mm nickel hardware. As I did not have a spare magnetic snap, twist or tuck lock to hand, for the fastening I have used a button and buttonhole on the flap. 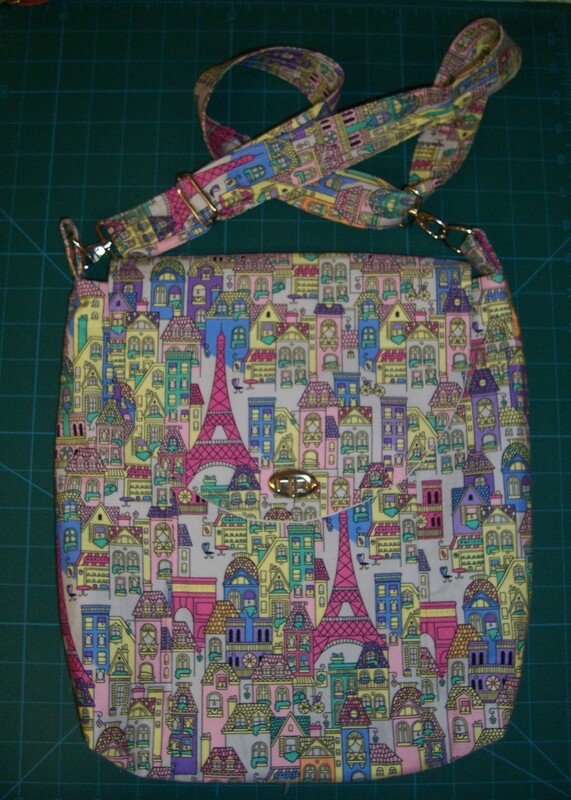 Unfortunately by down-sizing so much this has resulted in very small pockets both inside and out. 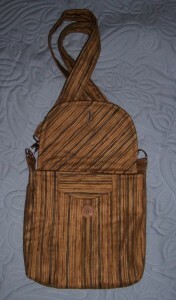 Also I feel that on this sample I have made the strap too wide so that it is out of proportion to the rest of the bag. 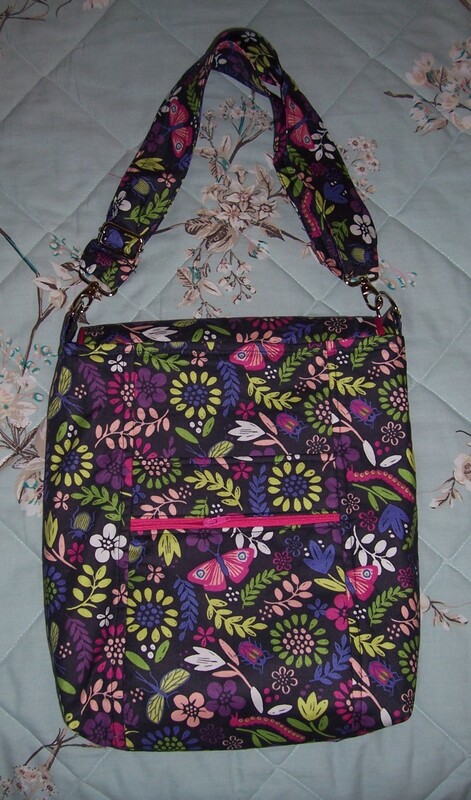 I have addressed some of these issues and now prepared a new cutting plan and sheet of instructions for putting this new sized bag together. I have developed a different way of constructing the rear zipped pocket which reduces the number of fabric pieces to be cut and also simplifies the construction making it quicker and easier. Overall I am pleased with the smaller bag although for my own personal use I think I will increase the size slightly so that the final bag measures approximately 10 inches square. 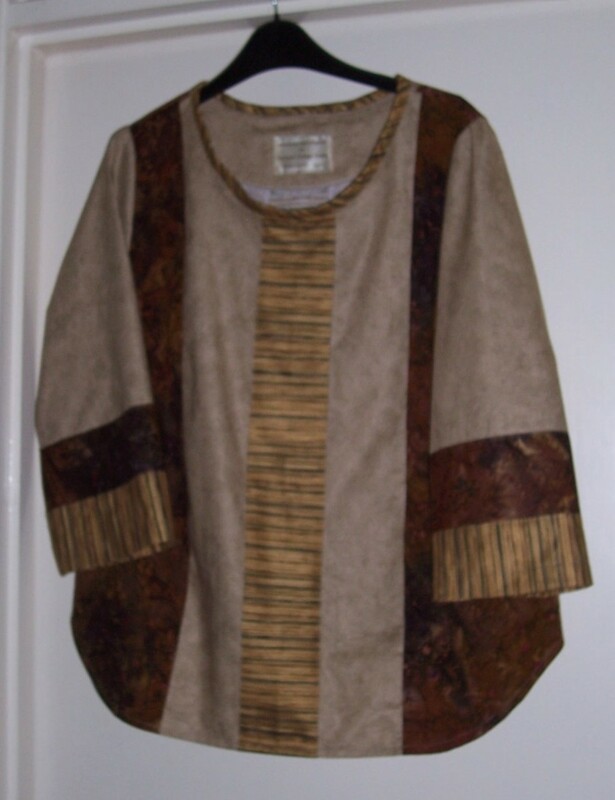 I had intended to make this tunic top to co-ordinate with the Batik/Striped reversible wraparound skirt but it has not proved to be 100% successful. Lesson learned – don’t be in so much of a hurry to complete a garment in one sitting and think out a definite plan when print and colour blocking rather than “winging” it! I had lengths of the Batik and Striped fabrics left over from the skirt project plus approximately 2.5 metres of a plain Light Tan/Beige cotton recently purchased from New Threads, Weyhill Fairground. I decided to make the bodice in blocks of the fabrics, 3/4 length sleeves plus a cowl neckline in the Striped fabric which should look good as it would be cut on the bias. First I measured the neckline of the bodice and drafted a pattern for the cowl collar which I cut from the Stripe fabric. Then I stitched bands of the Batik, Stripes and Plain fabrics together and cut the bodice front and back. 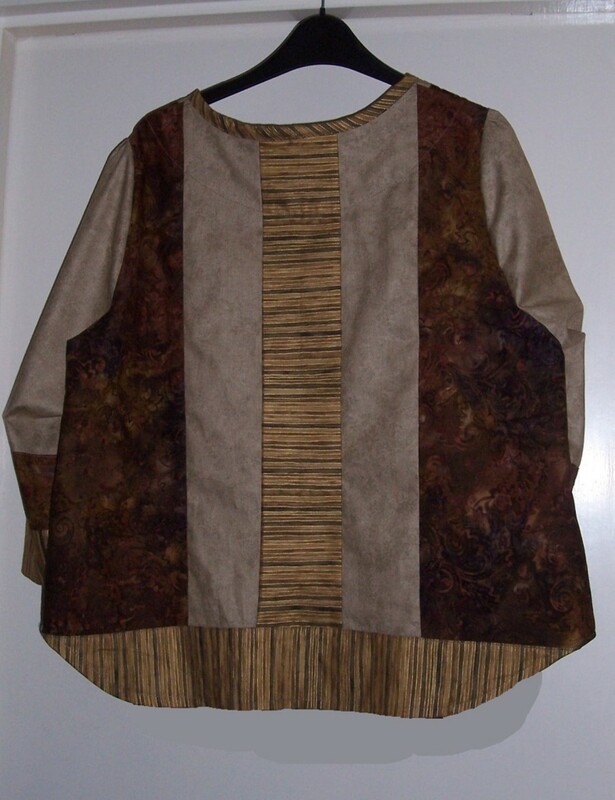 As I did not have sufficient fabric in the Batik I found that I had to shorten the length of the top by 2 ½ inches. Due to mis-measurement I then had to insert an extra band of the stripe into the back bodice plus another at the hemline. By now the bodice was beginning to look rather like a “crazy patchwork” rather than pre-planned print and colour blocking. Not the look I was hoping to achieve. I stitched the shoulder seams and stay-stitched the neckline. Prepared the cowl collar and attached. Not good. There was not enough depth to the collar at the front and too much depth at the back. I tried folding the back collar down but it just did not sit right at the front. I removed the cowl, cut it down and attached as bias binding to the neckline. But this was a little too long and now the bias binding stands proud of the neckline rather than flat to the body. Having got this far I was determined to carry on. The combination of print and plain on the sleeves seemed to work OK but I had the devil of a job inserting the sleeves into the armholes. I ended up with a small box pleat at the shoulder seam which makes the garment look “homemade” rather than “handmade”. I am very disappointed with the garment so it will be consigned to the “charity” bag with immediate effect. Here is the fourth version of the wraparound skirt. 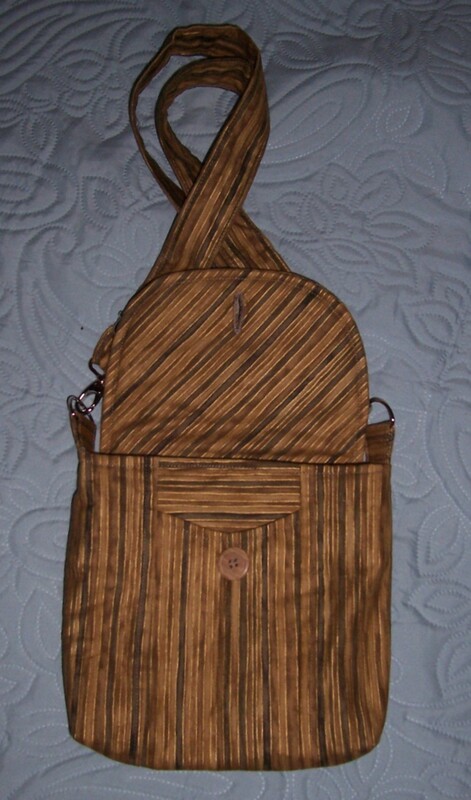 This time I used a Brown Batik print purchased from New Threads, Weyhill Fairground and a lining of a Brown/Tan striped cotton from my stash. The construction was fairly straightforward. In order to reduce bulk I stitched the darts in both fabrics and pressed the Batik fabric ones to the centre and the striped fabric ones in the opposite direction. The side seams were all pressed open. I decided that I would make the skirt reversible and also to curve the lower edge of the overlap so that I would not need to be quite so precise when matching the hemline. I placed the two skirts right sides together and stitched all around excluding the waistline. Then there was some precise turning and pressing involved to ensure that neither fabric showed on the opposite side. I think I have managed to achieve that. I then stitched the two skirts all around the edges using my trusty twin needle. 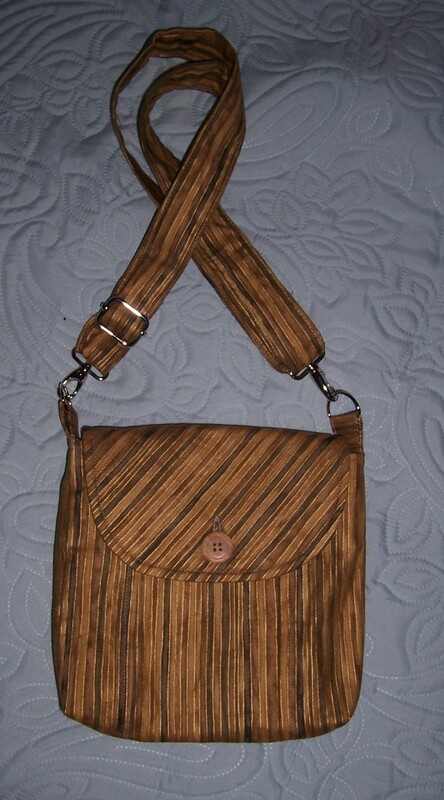 I stitched from the Batik side with Dark Brown thread and had a pale Beige in the bobbin for the Striped side. I had hoped that the zig-zag of the bobbin thread would provide an interesting finish for when the skirt is worn stripe side out but unfortunately the final result is not quite neat enough. 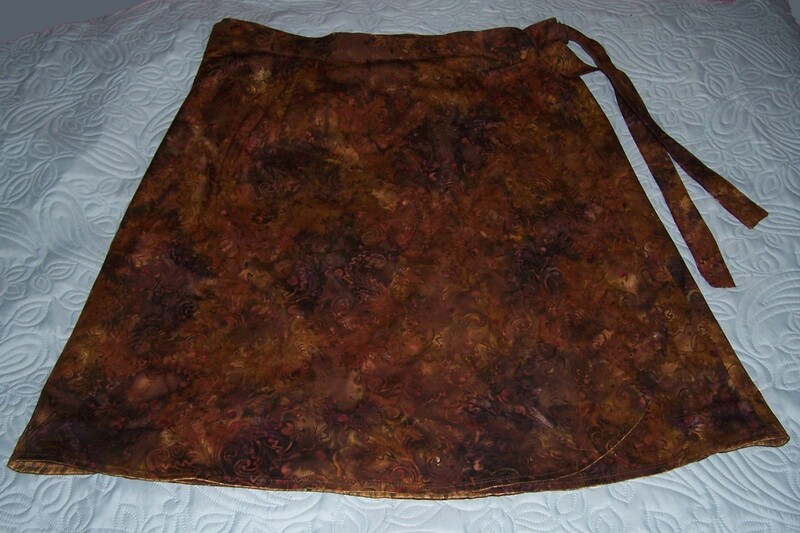 I used Vilene 220 fusible interfacing in the waistband which was cut from 3 widths of the Batik fabric x 4inches wide. Having decided on the length required to hang from the right front (overlap) I pinned the remainder of the waistband to the skirt. I stitched the short ends of the ties right sides together, then folded in ½ inch turnings before folding the band and ties in half and pinning before top stitching the ties and “stitched in the ditch” the waistband. I stitched the buttonhole mid-way between the right side seam and the right back dart. I had found with the Blue linen skirt that the buttonhole needs to be set fairly far around the waistband as otherwise, as I lose weight, the flap of the underside gets drawn through the buttonhole when tying together. By using two medium cotton fabrics this has provided weight to the skirt which I am sure will make a warm garment to be worn with opaque tights during the coming months.